Anyways, back to the book. I had picked up a copy after I had heard great things about it, but I didn't particularly enjoy it. I felt as though the author was jumping on the current trend of Dystopian YA books. It read like a bad take-off of The Hunger Games, which I had quite enjoyed. For anyone who doesn't already know the plot basics - it is set in Chicago at some point in the future. Society is divided into 5 factions (Amity, Dauntless, Abnegation, Erudite, and Candor) based on what they value and what they believe to be the cause of conflict. No back-history is given, so the reader never learns what events led up to this situation. At age 16, all children are required to choose which faction they wish to belong to - maybe the one that they were born and raised to, or maybe one of the other. They are subjected to an aptitude test to determine which faction they would best be suited for. There are also the factionless - those who for some reason have been kicked out of their faction, or are divergent (i.e. have aptitudes in more than one faction). 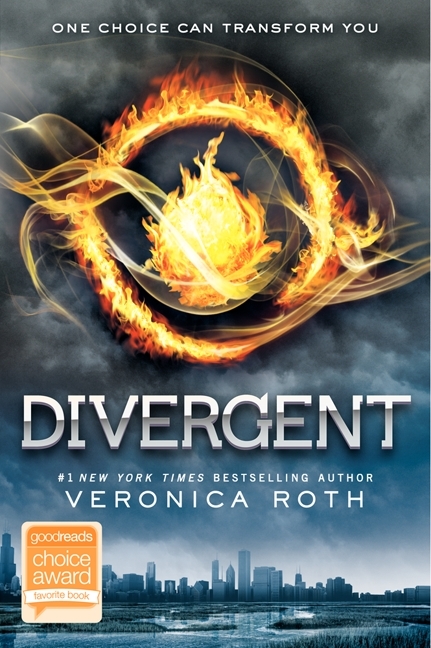 As you can guess from the title, the main character, Beatrice (later named Tris) is divergent. She was raised Abnegation, but chooses to become Dauntless. The story is about the challenges that she faces as a divergent, as well as what happens as inter-faction conflict develops. What I liked: it was an easy read - perfect for an airplane ride or two; the concept of factions was interesting (though I can't help but think that most people in real-life would be divergent); and the main characters, Tris and Four/Tobias were overall likable and realistic. What I didn't like: the secondary characters did not feel at all fleshed out - I didn't feel like I got to know them; it felt too much like a Hunger Games rip-off; no back-story was given at any point for the reader to understand how society got there; and overall it just felt a bit clumsy (I have to say that I wasn't surprised that it was mostly written while the author was a student and it was published when she was 22 years old). I generally do like dystopian literature (Margaret Atwood - I'm waiting for you to finish the Oryx and Crake trilogy! ); but I think that one of the key points to a good dystopian book is that it should make you reflect on current society. This book did not fulfill this expectation. With no background given, the society presented by the book seemed to bear no relation whatsoever to our current society, and so did not present any commentary on current society. Which left me feeling flat and detached. I don't think that I will bother reading the rest of the trilogy (Insurgent, and a 3rd yet-to-be-named book), unless I am desperate for an easy read and have nothing else on hand! I'm eager for the third MadAdam book too! Too bad this one didn't appeal to you as much as THG; I haven't read it yet, but it's on my TBR, though I'll finish Mockingjay before I start into Roth's trilogy. I've also heard good things about Marchetta's Jellicoe Road, in this vein. BIP - I've not heard of jellicoe Road - I'll have to look it up!